In this very special issue, we've got your back with real advice for working faster, and we build an entire track in one hour. Elsewhere, we're giving away PSP Audioware's cmDelay VST/AU plugin, and Freemasons' James Wiltshire steps in to reboot the Producer Masterclass series -get his project files, samples, and tons of wisdom in our huge in-studio video. Think it ends there? At CM, we know how to finish things, so for this feature's grand finale, we put our own advice to the test. In our Quick-Fire Track-Builder video, we set the timer running for one hour, and use the strategies we've introduced to put an entire track together. Watch the finished product in the video below, and see us putting it together in the full track-builder video, only in CM235. Our long-running Producer Masterclass series gets a reboot this month, as we venture to the studio of Freemasons' James Wiltshire, where the house music legend and all-round nice guy is kind enough to give us an 86-minute schooling on the art of production. In this huge in-studio video, James constructs a dancefloor banger before our very eyes, lifting the lid on his sound-design techniques, arrangement strategies and the gear he uses to make it happen. As well as the video, readers get to download the project files (in Live, Logic and Studio One formats) so you can boot the track up yourself and explore its inner workings. And you get a heap of James' analogue synth samples, too! Check out the first half of this huge video below, and get the rest with CM235. The newest addition to the CM Plugins collection is this stunning, creamy-sounding delay plugin from PSP Audioware (VST/AU/AAX/RTAS). Whether you're setting up a basic delay line or creating a lush, stereo modulation effect, cmDelay's got the guts to make it happen. In the mag, we run through its installation and uses in our videos to show you how far you can push this excellent plugin. 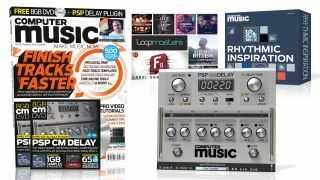 Get your hands on PSP cmDelay with issue 235 of Computer Music, and read the plugin's full spec to find out more! Since we're all about productivity this month, we've assembled an in-depth guide to the best time-saving software and plugins around. In this feature, we explain how to make your musical life easier using 'musical assistant' plugins, quick one-knob 'better-iser' plugins, automated multisample creators, and workflow enhancement software. We also give you a rundown of our top ten 'Swiss army knife' plugins that you should have with you at all times! If you're bored of the same old sample packs, follow us around the mean streets as we record and transform self-recorded sounds into huge mix-ready audio files. In this feature, we show you how to craft kicks from a rubber band, add rhythmic ambience to your projects, work with homemade percussion and more. We've got plenty of advice on how to get the best recordings you can, and how make the most of your sounds when processing them. To top it all off, we're including a sample pack of our own real-world recordings as a download for readers - this collection of 150 found sounds is ready to whip up and transform into production gold-dust. Check out the below video -there are three more waiting inside the issue! Learn the music theory behind Irregular Time Signatures like 5/4 and 7/8, and find out how to make them work in a track.